In the following YouTube video, a woman spotted a bear alongside the road and decided to greet it with a friendly wave from her car. 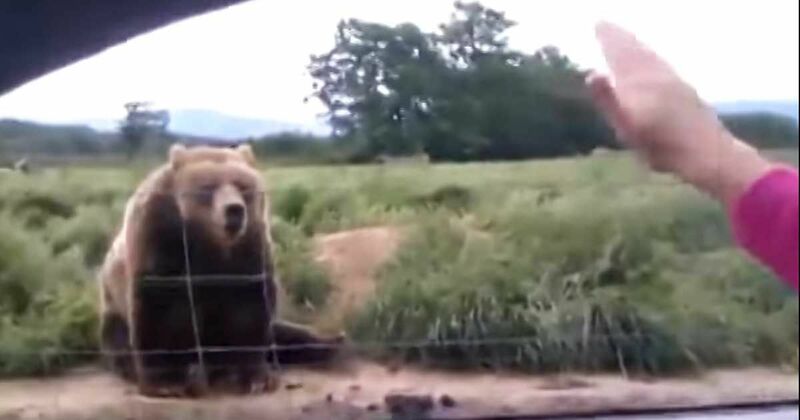 To the woman's shock and surprise, the bear quickly decides to wave back. This hasn't been the first time we've spotted bears behave like humans, but it's still very surprising the similarities one can find between humans and bears' behaviors. Bears can be playful, extremely curious, and avid explorers of their surroundings. Thought to be asocial compared to other animals like lions or wolves, they're actually quite the opposite and enjoy playing and socialize with their fellow bears. Marine Land Blog states that it's actually the usual range size of their habitat what prevents bears to interact more often, but that there have been many reports of bears playing together for "long periods of time." Bears can even be moody, like us, UDAP reports, and one bear may behave in a completely different way than others. In short, bears have distinctive personalities. However, as cute as bears can be, it's important to remember these majestic creatures are wild animals. According to BearSmart, bears are far from ferocious, aggressive creatures and instead are very responsive to their surroundings and curious animals. However, they warn, "more often than not, bear behavior is misinterpreted." The good news? BearSmart insists that bears are very predictable and that trait allows humans to "be able to react appropriately when you see them and avoid a negative encounter." What other surprising facts about bears do you know? Denali National Park visitors got a special treat as a grizzly put on a one bear show. This video of a tabby cat befriending 650-pound grizzly bear Griz proves that, despite the differences between us, we should all be able to get along. Not many people could look a large, male lion in the eyes. All we can say is thank goodness for durable glass!